FMR is turning 25 this year and in honor of our silver anniversary, we're planning a particularly special signature event, An Evening Celebrating the River, September 20 in downtown Minneapolis. As always, we'll celebrate the importance of a healthy Mississippi and all that FMR does to protect, restore and enhance this ecological and global treasure in our midst. 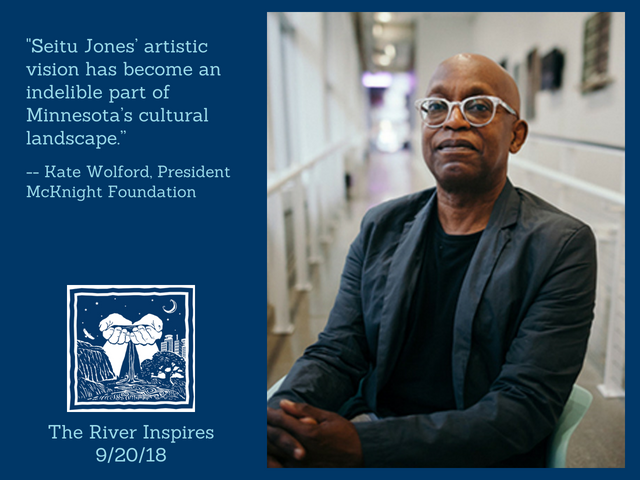 But this year, the theme is "The River Inspires," and we're shining the spotlight on the connection between the river and our thriving arts community. Because the Mississippi River is a muse for so much creativity and artistic expression, our event program will celebrate and feature local, acclaimed artists of various media who rely on our Big River as a source of inspiration and rejuvenation, for their work and their lives. One being esteemed, St. Paul-based visual artist Seitu Jones, our keynote storyteller for the evening. Jones is best known for creating more than 30 large-scale public artworks, both single-handedly and in collaboration with other artists and communities. From the artwork for three Metro Green Line rail stations (at the Dale, Lexington and Rice/Capitol stations) to Minneapolis’s Nicollet Mall where lie seven bronze, recessed sculptures in the sidewalk titled, "Shadows of Spirit," thousands of Twin Cities residents and visitors experience Jones' art each and every day. Growing up in south Minneapolis, Jones had a close connection to nature and the river flowing through our community. Surrounded by a family that treasured being outdoors, Jones recalls often being out on the water with his father, uncles and grandfather. His interest in studying plants even coined him the name “Little George Washington Carver” by his aunt. Perhaps that nickname was foretelling of St. Paul’s Frogtown Park and Farm which Jones helped establish in 2013 with his wife, Soyini Guyton, and their neighbors Anthony Schmitz and Patricia Ohmans. Created in partnership with the Trust for Public Land, the City of St. Paul and the Wilder Foundation, this 13-acre plot of woods, field and oak savanna includes a certified-organic urban demonstration farm in the heart of the diverse and vibrant Frogtown neighborhood. Here, neighbors can enjoy the beauty of nature, learn urban farming techniques and celebrate the community in which they live. Upon being awarded the McKnight Foundation’s Forecast Public Art Grant, Jones set out to create a floating sculptural installation, "ArtArk." FMR stands in awe of Jones' creativity, community-building initiatives and environmental stewardship. He's living one full life and continues to enrich our community through his thought-provoking and visually stunning art. We look forward to being captivated by his storytelling. Save the date and look to future Mississippi Messages for more information about FMR’s Evening Celebrating the River, Thursday, September 20. Or contact John Czyscon at jczyscon@fmr.org if you'd like to receive an email as soon as tickets are available.